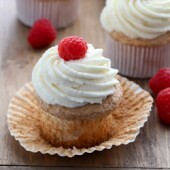 The perfect small batch moist angel food cupcake recipe, topped off with stabilized whipped cream and fresh berries. A fun summertime treat! Preheat oven to 350°F. Prepare a cupcake pan with 6 paper liners. Sift together powdered sugar, cake flour and salt, into a medium bowl. Set aside. In a large bowl or stand mixer, beat egg whites and cream of tartar until soft peaks form. With mixer running on low, slowly incporate granulated sugar. Increase speed and continue beating until stiff peaks form. Beat in vanilla. Fold in dry mixture in 3-4 additions, folding until batter is streak free and no dry ingredients remain. Prepare a large piping bag or gallon sized plastic bag with a round piping tip. Transfer batter to prepared piping bag. Divide mixture equally between 6 cupcake liners. Batter will be well above the top of each liner. Bake for 20-25 minutes or until golden and no longer tacky. Cool in pan for 2-4 minutes or until easy to handle, then transfer to a wire rack to cool completely. To prepare whipped cream frosting, add water to a small bowl and sprinkle gelatin over the top. Allow to sit for 5 minutes. Heat 2Tb heavy cream in a small bowl for 15 seconds, or until steaming. Pour warm cream over gelatin and whisk gently to combine. Transfer to the refrigerator for 5 minutes to cool. Beat heavy cream and powdered sugar on medium-high speed until soft peaks form. Whisk gelatin lightly, add into whipped cream and continue beating until stiff peaks form. Transfer to a piping bag with desired piping tip. Frost and top off with fresh berries. Best chilled until ready to serve. Will keep for up to several days.